Stained glass conservators at the Burrell Collection in Glasgow have started an important project, and are blogging about it! Fig. 1. 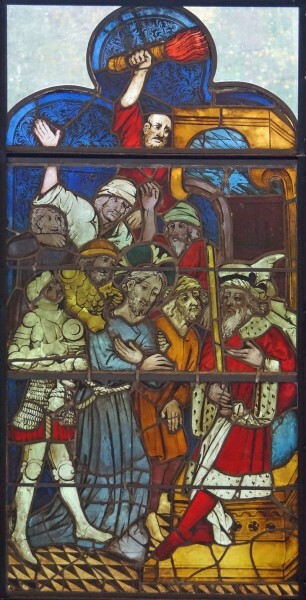 Christ before Pilate panel, from the Life of Christ and the Virgin window, Burrell Collection. Senior Conservator Marie Stumpff has been awarded a fellowship that will enable her to focus on research into and conservation of a group of three large windows from the Carmelite church at Boppard-am-Rhein, Germany. She will be assisted by Megan Stacey, who has been appointed Junior Fellow for the duration of the project. 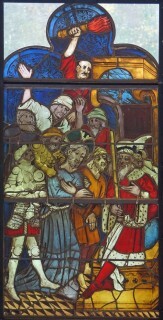 The original glazing scheme at Boppard was vast, and the story of the removal of the windows from the church has fascinated researchers for a long time. What is truly unique is the fact that much of the glass has survived and is now dispersed among various institutions and private collections across Europe and the United States of America. The aim of the two-year project is to document the current condition of the windows in the Burrell Collection and to study their restoration history, in order to create a benchmark against which future conservation treatment of windows from Boppard can be measured. A conservation plan will be developed that recognizes that the Burrell windows are part of an internationally distributed collection and should therefore not be treated in isolation. A key part of the study will be to visit other institutions that hold significant collections of stained glass from the Carmelite church, to learn from the approaches of other conservators to the conservation and restoration of these windows. Fig. 2. 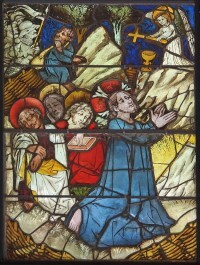 Agony in the Garden panel, from the Life of Christ and the Virgin window, Burrell Collection. A recent condition survey has confirmed that many of the Burrell panels are showing signs of structural deterioration. The Boppard windows consist of 34 panels that amount to 14 square metres of glass. They have been on display continuously since 1983, when the Burrell Collection opened, and have not received any conservation treatment in the intervening years. Their display in the south-facing gallery has exposed them to fluctuating relative humidity and temperature. The effect this has had on the glass, the vitreous paint and the lead is difficult to determine, as there are no detailed records or photographs to show what their condition was when they first went on display. By analyzing corrosion samples from affected glasses, studying the gallery environment, and comparing the condition of our Boppard windows with those held by other institutions the Burrell conservators hope to understand the factors that have contributed to the glass’s deterioration. The final element of the project will then be the conservation and restoration of the stained glass. Readers can follow the progress of the project on the blog. This entry was posted in Issue 68, News. Bookmark the permalink.